Photos Are Our Life Stories…Do You “Show and Tell” Yours? 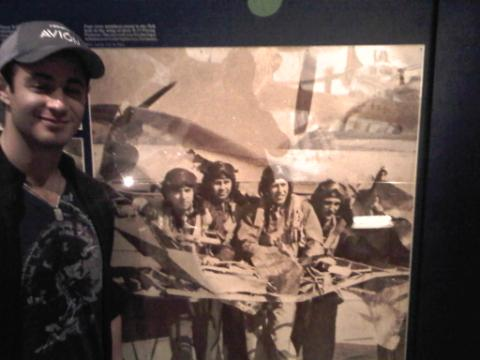 Pictured: My son standing by a WWII photo of my Dad (3rd from left) displayed at Air and Space Museum in Washington D.C.
Photographs are the footprints of our lives. It shows us where we’ve been and who we used to be. It is a huge part of our legacy that we leave behind for our children and loved ones. Every photo has a back story. Sharing the stories bring special meaning to each of them and so shouldn’t we feel obliged to tell, and retell, our stories so they will endure through the generations? I want to share with you how my personal family history has been perpetuated in a very unique way because of photo organizing and storytelling. In recounting my Dad’s World War II stories, it occurred to me that without my Mom’s organized photo albums, we could not have made this special discovery. But it was not merely about the organizing of the photos, it was the significant storytelling that helped us make the connection. As children, we grew up with wondrous tales of Dad’s World War II adventures. He was a radio gunner, flying on a B-17 in the 8th Army Air Force. Every mission was a dangerous one. I never really understood that as a young child, but the framed shadow box that hung on our den wall, preserving his Purple Heart, Distinguished Flying Cross, Good Conduct, Air Medal, and Bronze Medal Star let me know that it was something special. It was a permanent commemoration of his heroic achievements, and that would later set the stage for the endless storytelling he would eventually share with his grandchildren. There was one particular photo (pictured) that my Mom had in her organized photo albums, that depicted one of my Dad’s last missions. It was significant because this particular mission, nose-arted with “Angel in DeSkies” was not his regular crew. In fact, he barely knew them. His previous crew on “Idiot’s Delight” crashed and burned, leaving no survivors. For reasons unknown, he fortunately never flew that mission. Nonetheless, this photo became a “classic” in our family history. We also looked at it often because of its nostalgia and the fact that family resemblance was uncanny to that of my maturing brother at the same age. When my children were able to understand, they appreciated their Grandpa’s history, loved and admired him as he often wore his notorious B-17 baseball hat with such pride. They loved playing with his army gear and canteen since they were actually authentic souvenirs of war, a foreign concept back then. Years later, we visited Washington D.C. and while at the Air and Space Museum, we meandered around the different exhibits and froze when we noticed an enormous mural on the wall. It was the very same picture of my Dad and crew standing in front of the B-17. Because it was such a familiar and noteworthy photo, we were able to recognize it immediately. Most importantly, if this original photo was never shared or spoken of, we would never have even known my Dad was even in the photograph. Like other vistors, we would have just passed it by. A story never told. Before my Dad passed away, he had the opportunity to take us all to a WWII Plane Exhibition in Florida at a local Boca Raton airport, where an original B-17 was displayed for all to view. Volunteers permitted interactive tours and so my Dad was only too happy to have his grandchildren climb into the very tight quarters of his simulated radio gunner seat and re-enact history. A day for my children to cherish, always…and yes, of course, we have the photographs! Two years ago, my son returned to Washington D.C. with friends and was eager to revisit the museum to look for his grandpa’s photo. It was still there. 🙂 We will continue to tell his stories, and we are honored that these memories are captured on display in such a prestigious museum, to be visited for generations to come. I now realize that when I was a young Mom, I was so caught up in the moments, I was too busy to realize how significant they actually were, until they passed. So now when our family makes the time to revisit the good old days through my photos, I’m so grateful to have them. We can trace our lives through these photos. It is our timeline. They rekindle the memories and compel us to retell the stories. No doubt there is great value in photo-organizing but suffice it to say, it can be as simple as a labelled shoebox. How you organize and preserve your family heirlooms is discretionary. Understand that they are invaluable treasures. Find the old special photos, label them, and share their stories with your family. Take new photos and don’t bury them in virtual folders. Be creative with your storytelling. The great thing about a good photo is that it speaks a thousand words. It’s a great opportunity for show and tell, don’t you think?